On the 31st October 2017, Joanne Laythorpe, PA to Directors and Senior Managers at Construction Testing Solutions suffered a cardiac arrest while at her desk. The office team provided lifesaving CPR support while they waited for an ambulance team to arrive. “Hat’s off to the team” said Joanne “without their support, I wouldn’t have got through it”. Having technically died for a few minutes, the initial ambulance crew were able to revive Joanne and keep her stable before the Air Ambulance team arrived on the scene. Due to the extent of her condition, Joanne was airlifted to the Northern General Hospital in Sheffield where she received specialist cardiac care and subsequent recovery support. 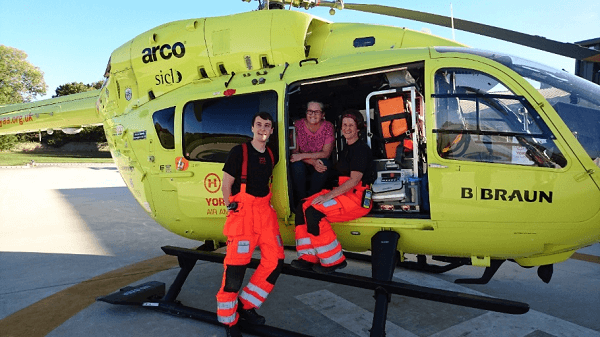 On 28th September, Joanne and her family visited the Yorkshire Air Ambulance airbase at Nostell for a VIP tour of the airbase and to say thank you to the paramedic crew, Sam McCreesh and Sammy Wills, who helped to save her life last year. “It was very emotional, interesting, informative and humbling to meet Sam and Sammy and see the equipment that kept me alive en-route to hospital.” said Joanne, “It was a tough experience, I was very nervous beforehand, but they were so nice and totally put me at ease.”. Joanne meeting Sam and Sammy from the Yorkshire Air Ambulance crew in the helicopter used on the day. Joanne’s ordeal has led to change not only within Construction Testing Solutions but also the whole CET Group; resulting in the addition of defibrillators into all CET buildings to support our teams’ well being day-to-day. Jason Ramsey and Claire Mason, our team members that helped keep Joanne alive while waiting for the ambulance crews, were also recognised with a ‘Special Recognition award’ at CET Groups’ annual CET Oscar’s awards in June 2018. If you would like to donate to support the great work of Yorkshire air ambulance, please donate here.